Windows Phone has a role to play as the mobile branch of the Windows 10 ecosystem, so it's here to stay. Windows Phone isn’t going away. You might think it was doomed, following Microsoft’s reorganization of its phone business just days ago, especially after Microsoft wrote down the value of the business. Microsoft CEO Satya Nadella put those fears to rest, however, in an interview with ZDNet’s Mary Jo Foley. Nadella has emphasized, time and again, that his goal is for Microsoft to establish new product categories that partners can build upon. In the phone business, however, partners haven’t followed Microsoft’s lead. Nadella seems to be fine with that. “If there are a lot of OEMs, we’ll have one strategy. 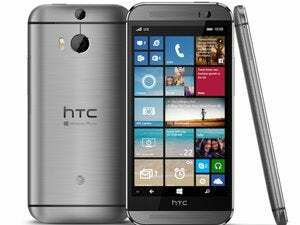 If there are no OEMs, we’ll have one strategy,” Nadella said of Windows Phone's future. Microsoft seems content to go it alone, or if a hardware partner like HTC or Samsung commits to the platform, that’s fine too. Why this matters: Sticking up for Windows Phone shows how committed Microsoft is to supporting new categories of devices. This is something Nadella started talking about as early as the Surface Pro 3 launch, when he basically said that Microsoft would set an example for the hardware industry to follow. As Nadella told Foley, that strategy has carried over to app development like Sway or Gigjam, where Microsoft is breaking out of the traditional Office hierarchy to create cross-disciplinary apps. He also more plainly explained how Mcrosoft’s vision will affect developers and consumers, especially in the mobile space. Nadella has previously characterized Windows 10 as an operating system that straddles multiple hardware platforms: the desktop PC, the notebook, the tablet, the phone, the Surface Hub, HoloLens, and the Xbox. The market hasn't really bought this story so far, at least where Windows phones are concerned. In the Foley interview, however, Nadella made clear that he sees Windows 10 Mobile as part of the billions of Windows 10 devices, not as a standalone operating system, as it is now with Windows Phone 8.1. “You start the journey there and take them to multiple places. Their app can go to the phone. They can go to HoloLens. They can go to Xbox," Nadella said. A key focus of those apps—phone or desktop—will be the business market. 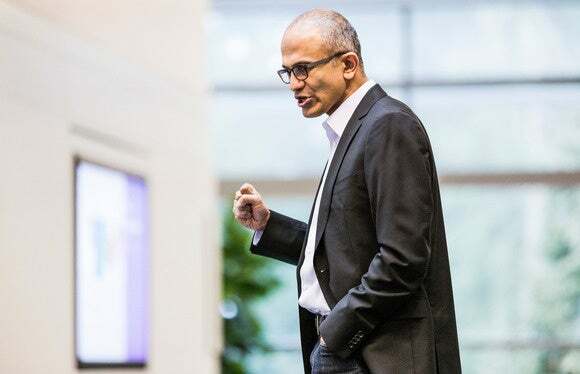 At the time of the restructuring, Nadella said Microsoft’s phone business will focus on three things: low-end communications devices, flagship Windows phones, and business devices. Business devices, surprisingly, will include HoloLens as well. Microsoft bought game developer Mojang so it could use Minecraft as a vehicle for mixed reality, but you should think of HoloLens as a business tool first, Nadella said. “Gaming will always be a scenario and there will be other entertainment broadly. But, with the [first version] of HoloLens, I want us to push a lot more of the enterprise usage,” he said. Honestly, it’s only the most passionate Microsoft fans that seem concerned about Windows Phone’s future. Wall Street—granted, never the most accurate barometer of a company’s health—has left Microsoft’s stock price virtually unchanged, climbing a little less than a dollar from the day of the restructuring on July 8 to $45.76 at press time. Still, we now know this: Microsoft’s in phones for the long haul. And that’s reassuring both to fans of the platform and to those who are keeping an eye on Microsoft’s long-term vision for Windows 10.